PLEASE SHARE ADDITIONAL INFORMATION YOU MAY HAVE CONCERNING THE ORIGINS OF THIS FAMILY. 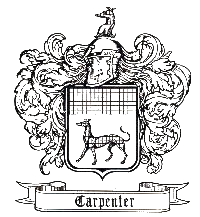 You have reached the family pages of Alton D. Carpenter a repository for information about our family history, some descendents of Benjamin Carpenter, and links to sites of general interest. The information in these pages may be used freely for genealogical purposes. Please do not use any of the information for commercial purposes without approval. I once knew a lady whose surname was Charpentier. She told me that my ancestors left France, went to England, and forgot how to spell their name. Ecclesiastes1:4... One generation goes and another comes; but the earth is for ever. The sun comes up and the sun goes down, and goes quickly back to the place where he came up. The wind goes to the south, turning back again to the north; circling round for ever. All the rivers go down to the sea, but the sea is not full; to the place where the rivers go, there they go again. All things are full of weariness; man may not give their story: the eye has never enough of its seeing, or the ear of its hearing. That which has been, is that which is to be, and that which has been done, is that which will be done, and there is no new thing under the sun. Is there anything of which men say, See, this is new? It has been in the old time which was before us. There is no memory of those who have gone before, and of those who come after there will be no memory for those who are still to come after them.